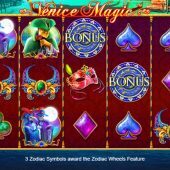 Venice Magic slot was created by Side City Studios, a subsidiary of Nextgen and they have brought us a taste of the beauty and canals of this famous waterlogged city. The game is set over a painting depicting the sights of Venice and naturally features gondolas and the old buildings with their piers but alas no Cornetto's are apparent anywhere (obscure 80's ice-cream TV advert reference right there...). The symbols are quite similar to Nextgen's Venetian Rose so this rather unusual theme is actually not the first from the NYX platform! We play to a soundtrack of classical Venetian music which is somewhat ruined by the abrupt and harsh ping as we press to play, but will the Gondoliers be able to navigate us through the maze of waterways with our bankroll intact? Venice Magic gives us 25 paying lines over the usual 5 reels of 3 rows and the icons are not stacked but it is possible to see 2 on the same reel, separated. There is one icon we won't see twice on a reel though, the Golden Lion statue which pays 100x bet for a full 5-of-a-kind and there is a large gap down to the rest. 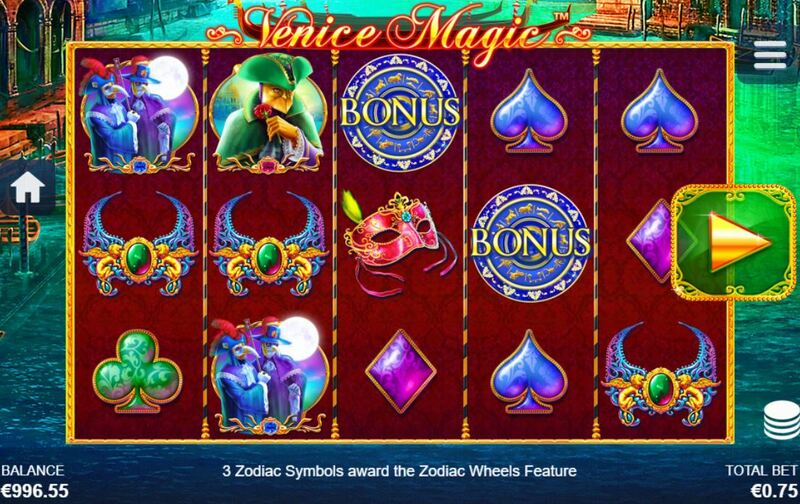 There are three masked ball characters awarding 20, 4 and 3x bet respectively and three costume parts such as the mask, collar and fan offering 1.6x down to 1x bet for the 5. There are four card values depicted pictorially and these will pay 0.8x for a full line. There's won't see any Wild Water in this city of calm unless it appears randomly at the start of the spin. You may see 1 to 4 Joker Wilds thrown onto the grid and should these help in any winning combinations they double them. Now it wouldn't be fair to ignore the wonderful Venetian architecture so you may also see any one or two reels randomly turn to Bell Tower Wilds before the reels spin, but there is no multiplier for those. If 3 Zodiac Discs land on the centre three reels you will be taken to a screen of 3 interlocking wheels. The left one will display a number of free games ranging from 5 to 15, the smaller centre wheel multipliers of 2, 3 or 5x and the final wheel on the right will stop on either Tower or Joker Wilds - you will then have the selected one appear in all your free games. You can't retrigger them and the best you can get is 15 spins at 5x multiplier, but if you have the Joker Wilds they still double thus you could be getting 10x on your wins. With the top Golden Lion icon this could result in a 1000x stake spin!